We’ve been having a real heat-wave here in Portland this week, with temps around 100 each day (today is cooling just a bit!). I happened to have tickets to a couple concerts, bought a couple months back, and figured I better just get out there and brave the heat. So Tuesday night was Sonic Youth at Roseland, usually air-conditioned, but on this night it was a real sweat-box! I missed almost all of openers Awesome Color, who were finished before 8:30. Then just after nine Thurston Moore bounded onto the stage, followed by his wife Kim Gordon in a shimmery & short silver dress, Lee Ranaldo, Mark Ibold on bass, and drummer Steve Shelley. The set featured a good portion of their latest CD, The Eternal, and the ‘youth’ sounded strong. They had 4 panels set up behind the band that looked like sheets with burned holes in them, but when the show started it turned out they were apparently lit from behind and provided a cool backdrop. Here’s a brief review from the Oregonian. Then last night was an outdoor show over at the Oregon Zoo. I walked over, taking the trails through the park, and got there a bit late. The ticket I had was for Orchestra Baobob, but at some point they cancelled and a new performer from Mali was put on the bill, Issa Bagayogo. I could see from the nearly empty parking lots that turnout was not so high. But once the sun got a little low, it was actually a lovely evening out on the grass in the zoo. The band was interesting, a high-tech/low-tech mix, with two musicians on traditional instruments (Issa plays stringed instrument with a gourd and a stick and it looked like six strings, but no neck or frets like on a guitar), and two on modern things (one guy with a laptop in back, another on a keyboard/synth). The band played a couple sets, dancers up front enjoyed the beats, and the all-ages crowd scattered on the lawn could sit and relax. On Saturday I paid a visit to the PDX Zinefest that was held over the weekend over at PSU. The Smith Ballroom was filled with tables of zinesters with their offerings – an overwhelming array of publications! 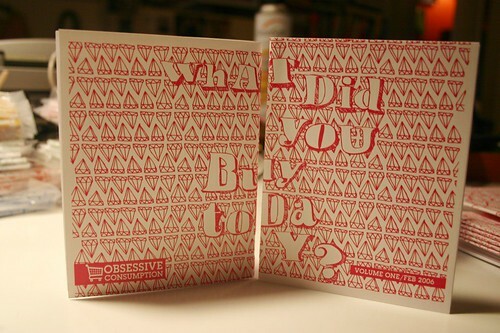 Zines these days cover just about anything – some are like mini-comics, some offer short stories and prose, some have practical information, some have artsy graphics, and some combine all of the above. The Multnomah County Library has quite a big collection of zines, so they were there as well, and they took the Polaroid above of me with the big library card. At the festival, I also had a chance to meet Kate Bingaman-Burt, whose work I’ve followed for a few years now. She does work that deals with consumerism at a personal level. She started by making drawings of her credit card bills (when she found herself getting deep into debt), and then shifted to doing a series of daily drawings called ‘What did you buy today?’. Kate now lives in Portland, and teaches at PSU, while increasingly showing her work in galleries. Earlier in the day I stopped in at Reading Frenzy, where they are offering lots of Kate’s work, including most of the daily purchase drawings. 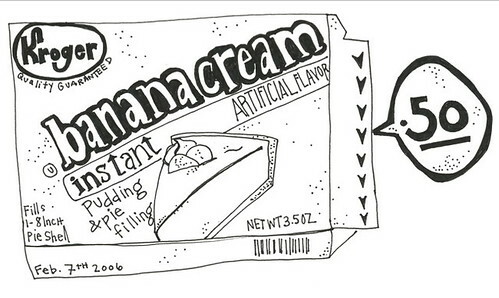 I bought one of the very first ones, from February 7, 2006, a drawing of a box of banana cream pudding, shown above. She was nice enough to give me a copy of the zine that contains that drawing, shown below. 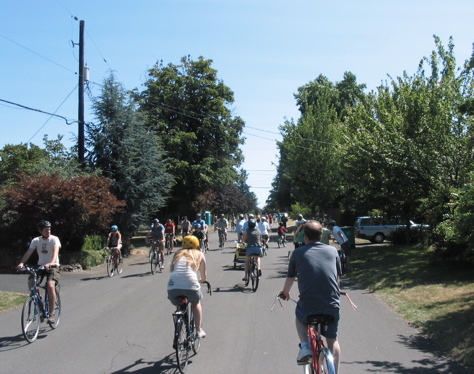 Today was the second ‘Sunday Parkways’ event of the season, this time in the Northeast. They closed off a bunch of streets to cars (excepting local inhabitants) and made a big loop of about 7 miles around the Alberta Arts district. People can ride either direction. It was a great sunny day for it! Lots of people out to enjoy, including plenty of kids. 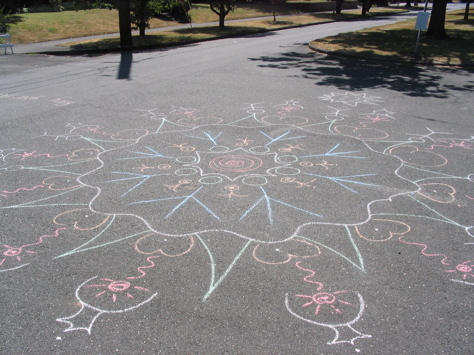 It’s nice to get the streets clear for a day… and the chalk artists were out in force. There were bands set up along the way, and more organized activities at several of the parks along the ride. And there were plenty of impromptu lemonade stands and the like, so I stopped in at one… it’s down in the left corner of this pic (this shot’s for oakhill193!). Biked over to the NW Industrial area last night to get to MacTarnahan’s taproom on NW 31st, for the free show in the parking lot with Derby and Ravishers. I had seen Derby last weekend at Doug Fir, and the set last night confirmed for me that they’ve got their act together – good stuff. And I also enjoyed openers Ravishers, also local, with a 2-guitar and drums lineup that worked pretty nicely. Stories – the notion that we attach a story to ‘explain’ many phenomena, and often the story takes on a life of its own. The remainder of the books asks a variety of general economic questions, like Why are there Depressions?, and weaves animal spirits into classical economic theory to provide a richer explanation of the phenomena. I found the book to be a little hastily written, not quite as throrough as I would have liked. And in some cases the animal spirits explanations seem so nearly obvious that it shouldn’t take two esteemed professors to have to make the case for them! The big question is how can the notion of animal spirits be woven into actionable policy in a way that makes sense, and the authors mostly don’t try to provide an answer… it’s a hard one. The building that it’s on is now owned by the University of Oregon, and they have been talking about changing the sign. It’s had a long history, and has been changed before: “Built in 1940 for the White Satin Sugar Company, it was changed in 1957 to read “White Stag” by White Stag Sportswear. The Naito family, owners of the Made in Oregon chain, again rebranded the sign in 1995.” (from this story in Willamette Week). 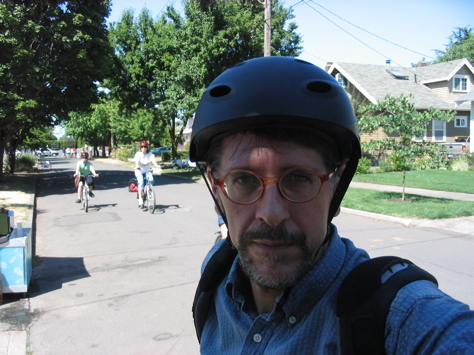 Update on July 14: I got in contact with BikePortland.org on this, and they’ve got a post about it. Feelings run deep about the stag! 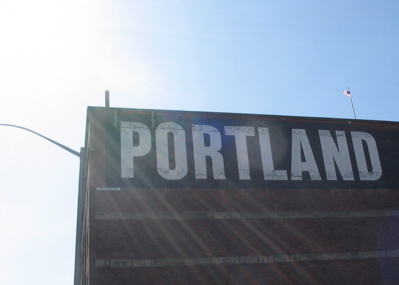 Update on July 19: Another item on the sign, this time in Willamette Week! I also saw that local bicycle part manufacturer Ruckus Components has a similar graphic idea. Made it out last night to the Doug Fir Lounge, getting there just in time for openers Derby to start their set. Hadn’t heard of them before, a Portland pop band, they played a really good set. I picked up the last CD, ‘Posters Fade’ and while it’s not quite to the level of the live set, it’s good too. Check ’em out at: http://www.derbyrock.com/. I’ll try to see them again on Friday at a show at MacTarnahan’s Taproom, starts at 5pm over on NW 31st. Headliners Minus 5 have a new CD out, called ‘Killingsworth’ (after a street here in the N/NE part of town. Scott McCaughey led a solid set, complete with steel guitar and two backup singers, along with Peter Buck in the back on bass. Here’s a short review from the Oregonian. In the beginning, A.I.G. F.P. had required its counter-parties simply to accept its AAA credit: it refused to post collateral. But in the case of the subprime-mortgage credit-default swaps, Cassano had agreed to several triggers, including A.I.G.’s losing its AAA credit rating, that would require the firm to post collateral. If the value of the underlying bonds fell, it would fork over cash, so that, for instance, Goldman Sachs would not need to be exposed for more than a day to A.I.G. Worse still, Goldman Sachs assigned the price to the underlying bonds—and thus could effectively demand as much collateral as it wanted. In the summer of 2007, the value of everything fell, but subprime fell fastest of all. The subsequent race by big Wall Street banks to obtain billions in collateral from A.I.G. was an upmarket version of a run on the bank. Goldman Sachs was the first to the door, with shockingly low prices for subprime-mortgage bonds—prices that Cassano wanted to dispute in court, but was prevented by A.I.G. from doing so when he was fired. A.I.G. couldn’t afford to pay Goldman off in March 2008, but that was O.K. The U.S. Treasury, led by the former head of Goldman Sachs, Hank Paulson, agreed to make good on A.I.G.’s gambling debts. One hundred cents on the dollar. While he doesn’t pursue the logical question in this article (my emphasis) – why exactly did Paulson think that the taxpayers should foot the bill of this mess, particularly at 100%? I drove up to Vancouver, BC on Sunday, spurred mostly by the jazz festival. Sunday – the Monterey Quartet (Dave Holland-bass, Chris Potter-sax, Gonzalo Rubalcaba-piano, Eric Harland-drums) with Vancouver-based October Trio & Brad Turner opening. Monday – an eccentric German quintet led by Alexander Schiffenbach, playing “Monk’s Casino” – various arrangements of Monk tunes. Tuesday – the Kenny Werner Quintet with Randy Brecker-trumpet, David Sanchez-sax, Chris Colley on bass and Antonio Sanchez on drums, with Fred Hirsch Trio opening. Kenny Werner encored with a solo piano performance of a Joni Mitchell tune “I Had a King” (he said she was his favorite musician of any genre). Wednesday – Chicago-based band The Sea and Cake (jazz=not so much, but a pretty solid show). 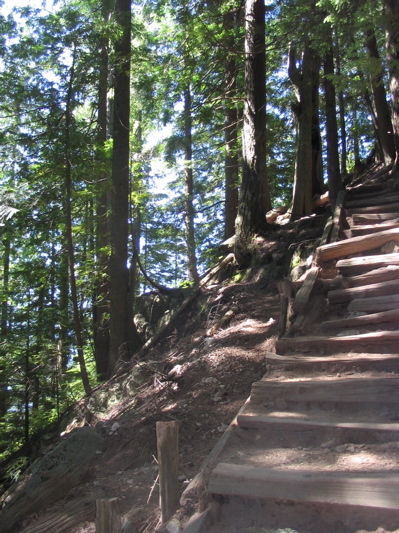 The picture above was from Tuesday, when I climbed the Grouse Grind, a trail that goes straight up the nearby ski mountain. Good views of the city from up top, and I got to see a grizzly bear up there as well (in a fenced area!). On Monday I visited the Vancouver Art Gallery, where they had a few interesting shows up: a large selection of Andreas Gursky photos, and in a twist most of them were printed at no more than about 14 inches wide, rather than the large-scale versions he usually shows; also photos from Los Angeles by Anthony Hernandez. I also made it to a cool museum show about bicycling in Vancouver, called Velo City. They had some nice profiles of various cyclists from the area, with graphics showing their main routes, ranging from BMX racers to daily commuters. They also had a great video showing some bike trails built in North Vancouver on the slopes, with bare wood ramps flowing over the mounds and gullies, and a few spots taking the trail on top of fallen trees. Not quite as much biking activity there as here, but I did see that they plan to take one car lane on Burrard Bridge for a bike lane very soon. Also on bicycles, found a good free magazine based there called Momentum (The Magazine for Self Propelled People!). Vancouver is hosting the 2010 Winter Olympics, with events around the area (skiing up at Whistler/Blackcombe), and then July 1 was Canada Day, so lots of patriotic pride up north!